1924: The Huff Daland Dusters, the predecessor of Delta, is founded in Macon, Ga., before moving to Monroe, La., the following year. This was the first commercial agricultural flying company . Huff Daland's 18 planes become the largest privately owned fleet in the world. Crop-dusting operations range from Florida to Arkansas, and west to California and Mexico. Later Huff Daland operates the first international mail and passenger route on the west coast of South America for Pan Am subsidiary Peruvian Airways. 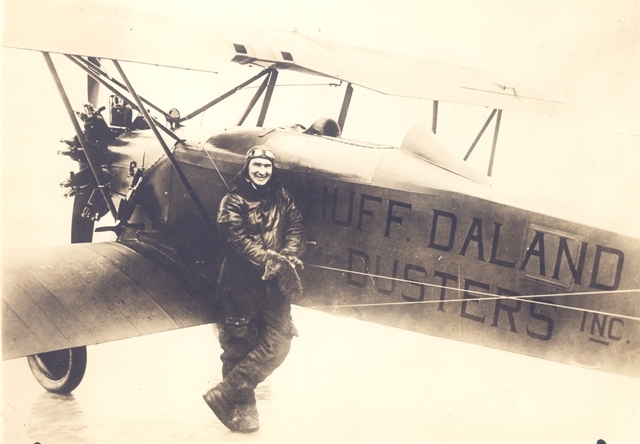 1928: C. E. Woolman, the principal founder of what would become Delta Air Lines, leads movement to buy Huff Daland Dusters. Renamed Delta Air Service for the Mississippi Delta region it served, the new airline is incorporated on Dec. 3, 1928. D.Y. Smith, President; C.E. Woolman first Vice President. 1929: Delta operates first passenger flights from Dallas, Texas, to Jackson, Miss., via Shreveport and Monroe, La. Travel Air S-6000B airplanes carry five passengers and one pilot. 1930: Service begins to Atlanta. Lack of mail contract forces suspension of passenger service. Company renamed Delta Air Corporation. 1934: Delta receives Air Mail Route 24 from Post Office; resumes passenger service. Begins operating as Delta Air Lines. 1935: Delta offers first night service with the Stinson Model A; first Delta aircraft with two pilots. 1940: Douglas DC-2 and DC-3 service introduced. 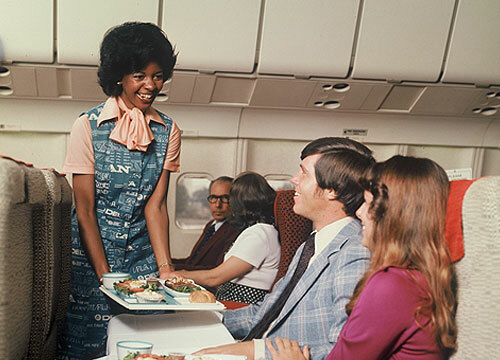 Flight attendants, called "stewardesses," added to flight crews. 1941: Delta headquarters moves from Monroe to Atlanta. 1942: Delta contributes to the war effort. Modifies 1,000+ aircraft, over-hauls engines/instruments, trains Army pilots and mechanics. 1944: First converted DC-3 cargo ship, Delta No. 43. 1945: Official corporate name becomes Delta Air Lines, Inc. Company recognized by National Safety Council for more than 300 million passenger miles and 10 years of flight without a passenger or crew fatality. C. E. Woolman is President and General Manager. Delta is the first airline to fly living vegetable plants (160,000 tomato plants). 1946: Delta starts regularly scheduled cargo service. The one-millionth passenger boards. First airline with nonstop Chicago-Miami flights. 1947: Delta's fleet totals 644 available seats. Receives National Safety Award for more than one-half billion passenger miles without a fatality. 1948: First U.S. interchange service with TWA personnel flying Delta planes from Cincinnati to Detroit and Delta crews flying TWA ships south to Atlanta, Miami and Dallas. 1949: Delta’s first coach service starts: discounted-fare night flights between Chicago and Miami. 1953: Chicago and Southern Air Lines merger brings Delta its first international routes (to the Caribbean and Caracas). Airline called Delta-C&S for the next two years. 1955: Delta pioneers the use of the hub and spoke system. Scheduled airplanes bring passengers to a hub airport where travelers connected to other Delta flights. Delta wins Atlanta to New York route. 1956: Radar installed in noses of all Delta aircraft. 1959: Delta is first airline to launch Douglas DC-8 jet service. The red, white, and blue triangle "widget" becomes Delta's logo resembling the swept -wing appearance of a jet. 1960: First airline to launch Convair 880 jet service. 1961: Flies first nonstop service from Atlanta to Los Angeles. Delta links California and the Caribbean with first jet service from California to Montego Bay and Caracas. Delta receives National Safety Award for flying more than 11 billion passenger miles without a fatality. 1962: Delta activates the electronic SABRE system for "instant" reservations. A Delta DC-8 is the first commercial plane to fly Los Angeles-Atlanta in less than 3 hours (02:57:11). 1964: The Deltamatic reservation system starts with IBM 7074 computers. 1965: Delta becomes first airline to launch Douglas DC-9 service. 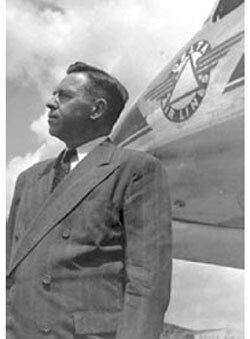 1966: Delta founder C.E. Woolman dies. Charles H. Dolson becomes Delta's second CEO. Crop-dusting division ceases operations. Delta is first with Lockheed L-100 Hercules cargo service. 1968: A reconditioned 1925 Huff Daland Duster given to the Smithsonian Institution as a memorial to C. E. Woolman, Delta founder. 1970: Delta has an all-jet passenger airplane fleet. Boeing 747 service begins. 1971: W.T. Beebe becomes Chairman and CEO. Delta Dash (cargo service for small packages) begins. 1972: Northeast Airlines merges with Delta. Delta becomes a major carrier in New York and Boston, with direct routes from New York and New England to Florida. Delta begins operating the Boeing 727. 1973: L-1011 TriStar service introduced. 1975: First airline to offer its own air express service, a new high priority, guaranteed cargo service called Delta Air Express. 1978: The Airline Deregulation Act passes. Delta begins trans-Atlantic service: Atlanta to London. David C. Garrett becomes CEO. 1979: Delta celebrates its 50th year of service; begins flights to Frankfurt, West Germany. Delta is the first airline in the world to board one million passengers in one city in one month (Atlanta in the month of August). 1980: Development of computer reservations systems (CRS) in the early 1980s. 1981: Delta launches Frequent Flyer Program (changed to SkyMiles in 1995). 1982: After Delta suffers financial losses, employees raise $30 million in payroll deductions to purchase the first Boeing 767, named "The Spirit of Delta." 1984: Delta strengthens ties to regional airline partners through its Delta Connection program. Delta begins service to Hawaii. 1987: Western Airlines merges with Delta; becomes the fourth largest U.S. carrier and fifth largest world carrier. Delta's first trans-Pacific service begins: Atlanta to Portland, Oregon, to Tokyo. Ronald W. Allen becomes Chairman and CEO. 1988: Delta opens operations in Asia. 1990: Delta is the first airline to offer MD-11 jet service in the U.S. Delta, Northwest Airlines, and TWA combine reservation systems, forming WORLDSPAN Travel Information Services. Delta and 23 civilian airlines participate in the Civil Reserve Air Fleet (CRAF) during Desert Storm/Desert Shield from 1990-1991, carrying passengers and military cargo. 1991: Delta purchases substantially all of Pan Am's trans-Atlantic routes and the Pan Am Shuttle, making this the largest acquisition of flights in airline history. Delta becomes a global carrier. 1994: Delta returns to profitability in fourth quarter, fiscal year 1995. 1995: "The Spirit of Delta" is rededicated and repainted in Olympic color scheme. Delta named the official airline of the 1996 Centennial Olympic Games. Received J.D. Power Award for best among major carriers for long and short haul flights. Delta is the first U.S. carrier to voluntarily ban smoking on all flights. 1996: Delta unveils the "Centennial Spirit," a new MD-11 jet painted in an Olympic design; transports the Olympic Flame from Athens, Greece, to Los Angeles for 1996 Olympic Games in Atlanta. Customers can make reservations and purchase tickets via Delta's Web site, SkyLinks. Delta starts low-fare airline Delta Express, with service from Orlando, Fla. 1997 Leo F. Mullin is named President and CEO. Delta is the first airline to board more than 100 million passengers in a year. Begins expansion of U.S.-Latin America routes. Introduction of new aircraft livery. Delta purchases the Boeing 777. 1998: Delta and SwissCargo forge the first international cargo alliance. Delta is the first airline to install automatic defibrillators on board all of its aircraft. First and business classes on international flights become a single section of luxury seats called BusinessElite®. 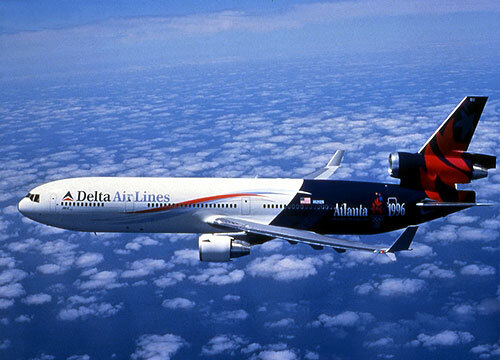 1999: Air Transport World magazine named Delta its global Airline of the Year for 1998. Aviation Week And Space Technology magazine named Delta 1999's Best Managed Major Airline. 2000: Launched SkyTeam, a global alliance, partnering Delta with AeroMexico, Air France and Korean Air. Places the industry's largest order of regional jets (500). Introduces new aircraft livery and a contemporary "widget" logo. Launches delta.com Web site, replacing “SkyLinks.” Carries 120 million passengers. 2001: U.S. airspace closed for two days after terrorist attacks on Sept. 11th. Delta posts first financial loss in six years. Delta carries Olympic Flame from Athens, Greece, to Atlanta for 2002 Olympic Torch Relay to Salt Lake City, Utah. 2002: Delta sponsors the 2002 Olympic Winter Games at its Salt Lake City hub. Technology advances bring convenience to customers through kiosks at check-in, expanded gate information systems and virtual check-in on delta.com. Delta, Air France, Alitalia and CSA Czech Airlines granted antitrust immunity for trans-Atlantic scheduling and pricing. 2003: Delta launches Song®, a unique low-cost subsidiary airline. Delta leads the industry with a new model for passenger check-in: lobby redesign, expanded kiosk use, the introduction of Delta Direct phone banks, lobby assist agents, and new signs and processes to improve traffic flow. Delta implements the largest domestic codeshare alliance with Continental and Northwest. Delta is the first U.S. airline to offer prerecorded audio flight information at the gate. 2004: Gerald Grinstein becomes seventh CEO. Delta celebrates 75 years of passenger service; returns to traditional "widget" logo. Customer service and ramp operations efficiency enhanced with a new automated load instruction system for baggage, cargo and mail; expansion of touch-screen computers with real-time flight and gate information on baggage transfer tugs; and staggered zone system for aircraft boarding. Northwest and Continental join Delta as full members of SkyTeam alliance. 2005: "Operation Clockwork" is the largest single-day schedule redesign in aviation history. Changes at Atlanta and Dallas/Ft. Worth restructure more than 51 percent of Delta’s network for better on-time departures, reduced airport congestion and free up aircraft for Delta's expanding route system. On Sept. 14, Delta files for reorganization under Chapter 11 of the U.S. Bankruptcy Code. In November, Delta starts one of the largest one-month expansions in its history with service on seven new Latin American and Caribbean routes. 2006: Service to more destinations than any global airline with 124 new nonstop routes and 41 destinations. Delta is National Safety Council's 2006 Occupational Industry Leader—the first airline recognized. J.D. Power Customer Satisfaction Survey ranks Delta second of the network carriers in overall customer service. Business Traveler readers name Delta "Best Frequent Flyer Program," "Best Airline Web Site" and "Best Airport Lounge." Song operates its last flight on April 30. Delta announces plan to transform New York-JFK into a major international hub. Delta launches first service to southern Africa with flights between Atlanta and Johannesburg via Dakar, Senegal. 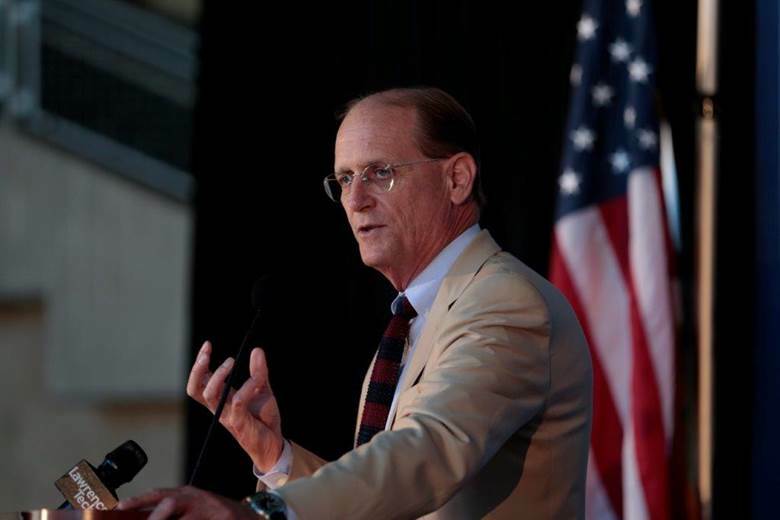 2007: Richard Anderson becomes Delta's eighth CEO. Delta defeats hostile takeover attempt by US Airways and completes restructuring plan one year ahead of schedule, emerging from bankruptcy on April 30 and relisting on the New York Stock Exchange on May 3.Led all network carriers in on-time performance for the year. J.D. Power ranks Delta second in customer service among network carriers for the second consecutive year. Announces trans-Atlantic joint venture with Air France. Completion of Open Skies agreement between U.S. and European Union allows Delta to fly to London-Heathrow; service initiated from Atlanta and New York-JFK. 2008: Delta acquires Northwest Airlines, creating a global airline with major operations in every region of the world. Delta grants approximately 15 percent of new company’s stock to employees. Becomes first U.S. airline to announce onboard Wi-Fi for domestic mainline fleet. Delta expands codeshare and marketing agreement with Alaska Airlines to increase customer connections across the West Coast. 2009: Delta celebrates 80 years of passenger service. Announces expanded trans-Atlantic joint venture with Air France-KLM. Becomes the only U.S. airline to serve six continents with introduction of nonstop flights between Los Angeles and Sydney, Australia. Completes integration of Northwest WorldPerks frequent flyer program into SkyMiles, creating the world’s largest loyalty program with more than 74 million members. Rebrands more than 240 domestic airports with Delta logos, replacing Northwest. 2010: Delta announces largest product upgrade in a decade with plans to invest more than $2 billion through 2013 to improve the customer experience, including installing new full-flat beds and personal, in-seat video on all widebody aircraft; adding more First Class cabins to Delta Connection regional jets; renovating and adding new Delta Sky Clubs; and adding more First Class seats on domestic mainline flights. Completes integration of Northwest Airlines' Airport and Reservations systems into Delta's technology platform. Receives approval to begin international flights at Tokyo's Haneda Airport. Announces plans for a $1.2 billion renovation and expansion of facilities at New York's John F. Kennedy International Airport. 2016: Ed Bastian, longtime Delta president, is named CEO, succeeding Richard Anderson, who retires and is named executive board chairman. For more information, see the Delta History Museum website.